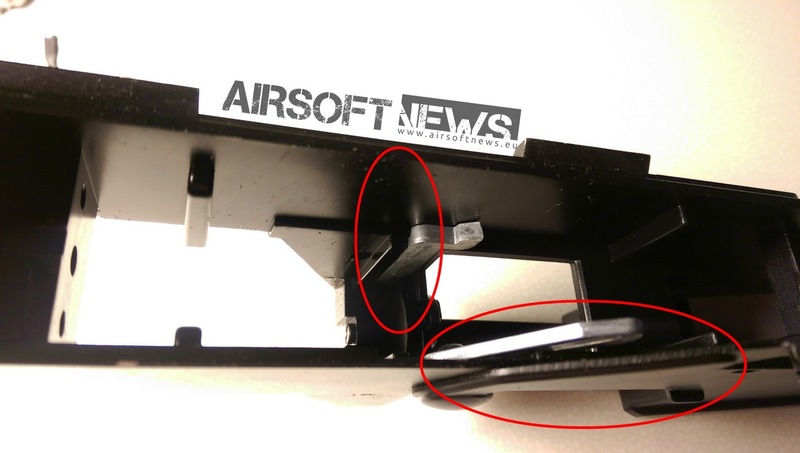 King Arms: VSS Vintorez in depth review. Good people at King Arms sent to us the desired VSS Vintorez, which is in my opinion one of the most beautifully designed guns. Its looks also tingle my Stalker gaming obsession, that I can’t seem to lose. 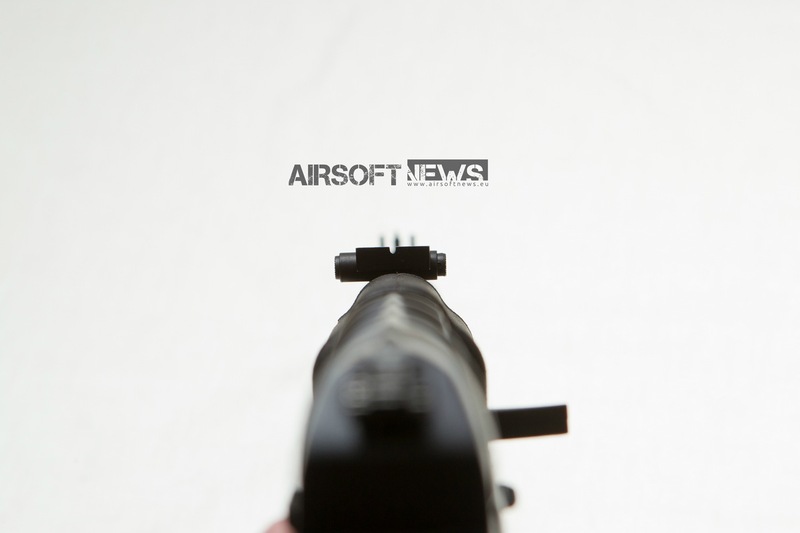 So here I am proud to bring to you the review of King Arms VSS Vintorez and the PSO-1 telescopic scope that was delivered as an extra to me. As you all know I can’t go without a short introduction of the real firearm. 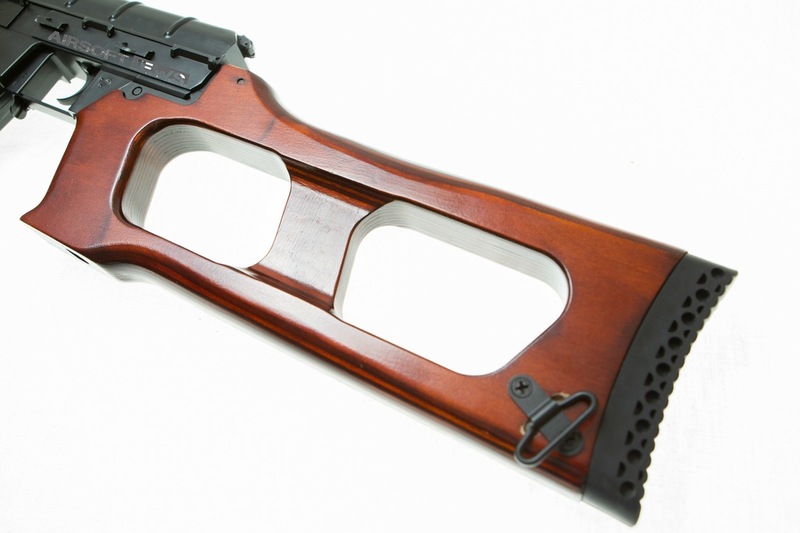 We airsofters are suckers for realistically copied guns, which we can own legally and often cheaper than the real ones. And who would not like to possess this classical beauty. 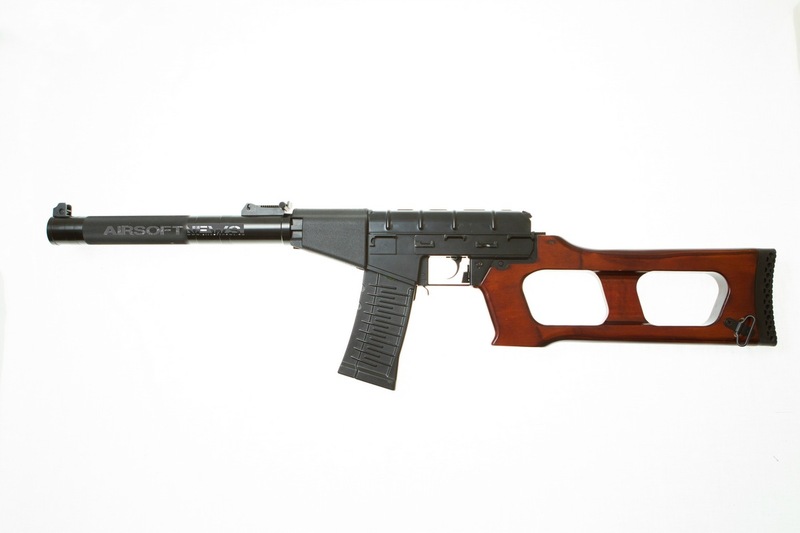 The VSS (or “Vintovka Snayperskaya Spetsialnaya“) is also called Vintorez (“thread cutter“) and is an integrally suppressed, gas-operated select-fire rifle that uses the heavy subsonic SP5 and SP6 9x39mm cartridge. 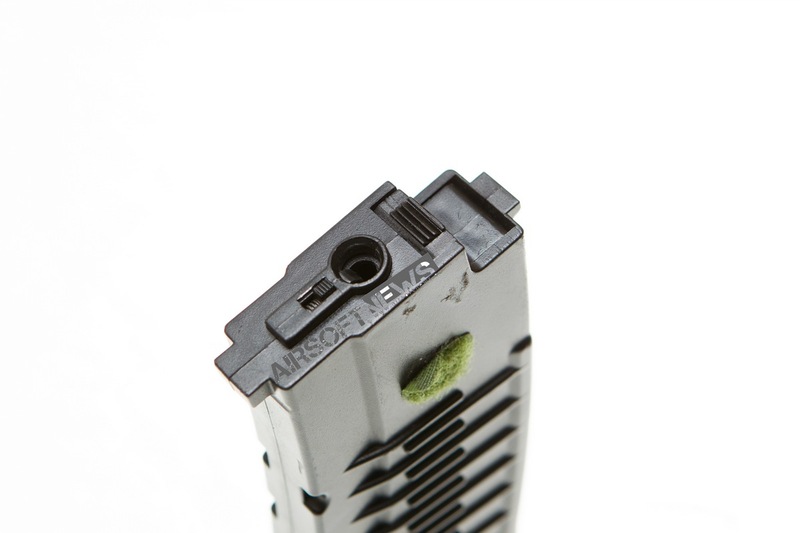 The SP-6 cartridge can penetrate up to 6mm steel, 2.8mm titan or 30 layers of kevlar at a distance of 200m. 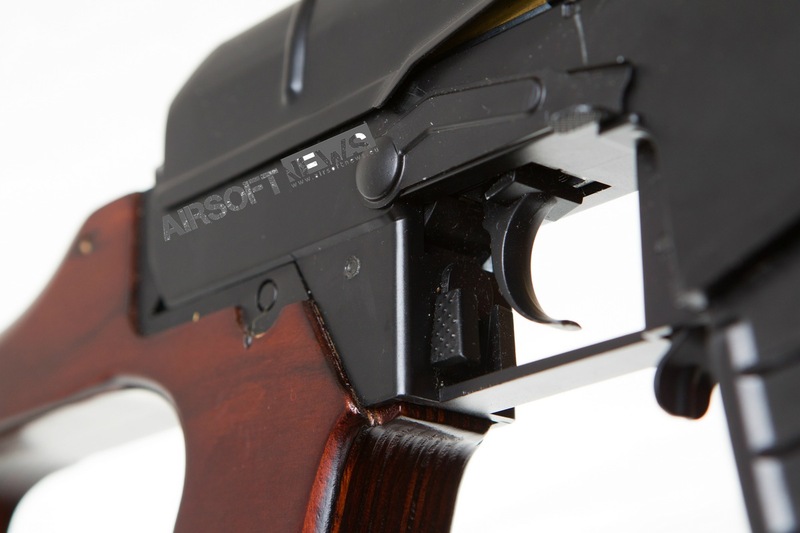 It was developed by the “Central Research Institute for Precision Machine Building” in the late 1980 and manufactured by Tula Arsenal, and it is in service from 1987 to current time. It is issued primarily to Spetsnaz units for undercover and clandestine operations, a role made evident by its ability to be stripped down for transport in a specially fitted briefcase. The info from Wikipedia provides a few more details. 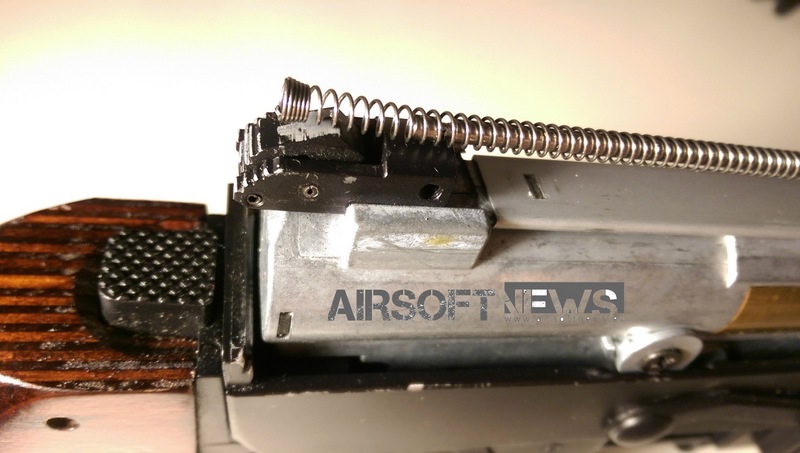 King Arms released the VSS AEG in February 2014 and it features a metal body with a side rail for mounting the PSO-01 optics with ease (which was also provided from King Arms), a CNC machined on-piece Aluminium 6061 outer barrel, a real wood stock with a rubber stock pad, a trusty version 3 7mm Gearbox and a 380rds highcap magazine. 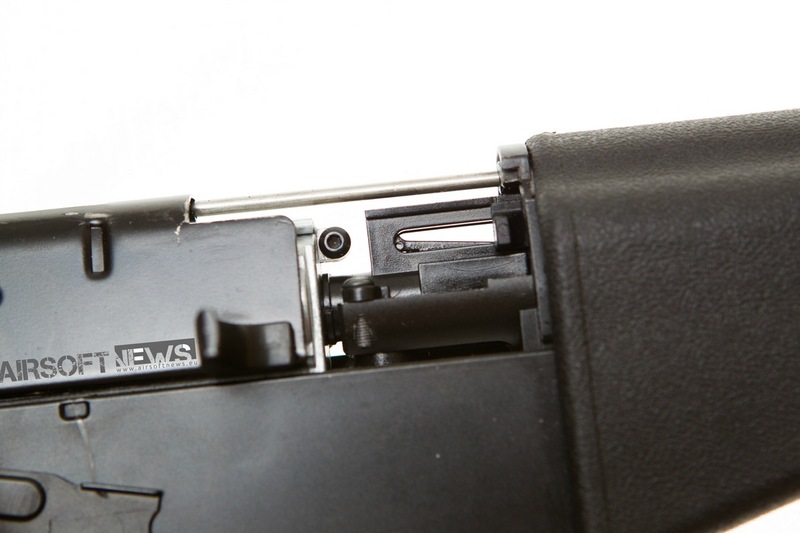 The top cover and the rear sling mount are made of steel. The VSS weighs just about 2.7kg (and so is a bit heavier than the real one) is 91cm long with an inner barrel length of 42cm so upgrading with precision barrels will not be a problem as it is the same length as M4 (422mm). When it comes to FPS readings the Vintorex excels with its consistency of 410 FPS. 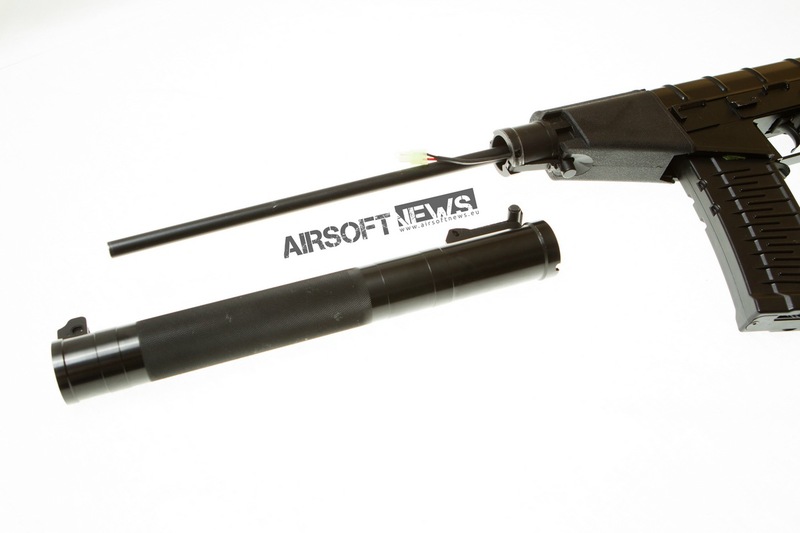 This also means that the inner barrel and the gearbox are well put together and have a nice air seal. 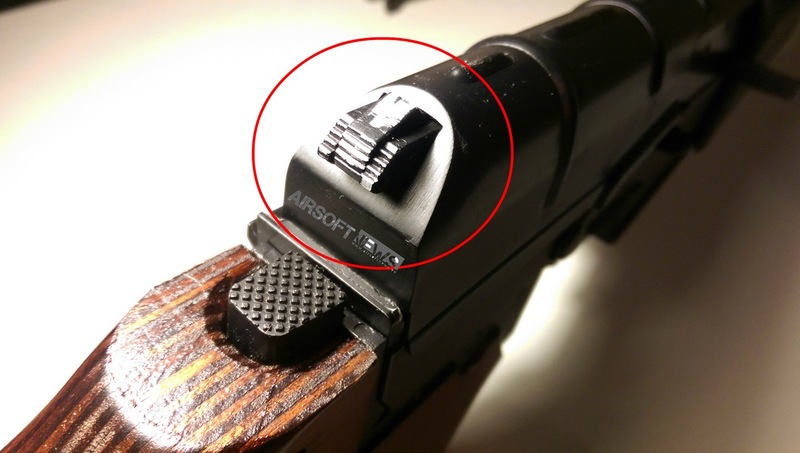 Every airsofter also knows that this translates in to a more precise shooting rifle. Which is in our world a must. When holding it in for the first time you start to appreciate the Russian engineering and how this guns seamlessly fits in your hands. But you will soon start to feel that something is a bit off. 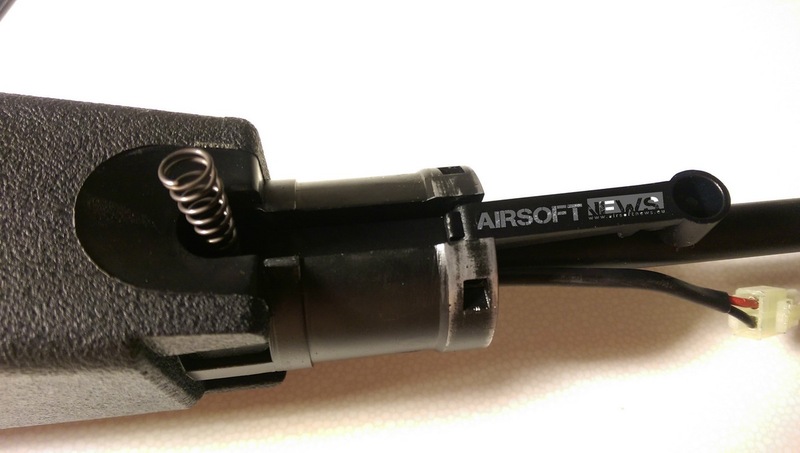 Because of the distinct design of V3 gerbox and the position of the motor the pistol grip is a bit to angular and can be a bit uncomfortable after a prolonged use. I recommend a bit of good old sand paper and you will soon have a comfortable rifle. 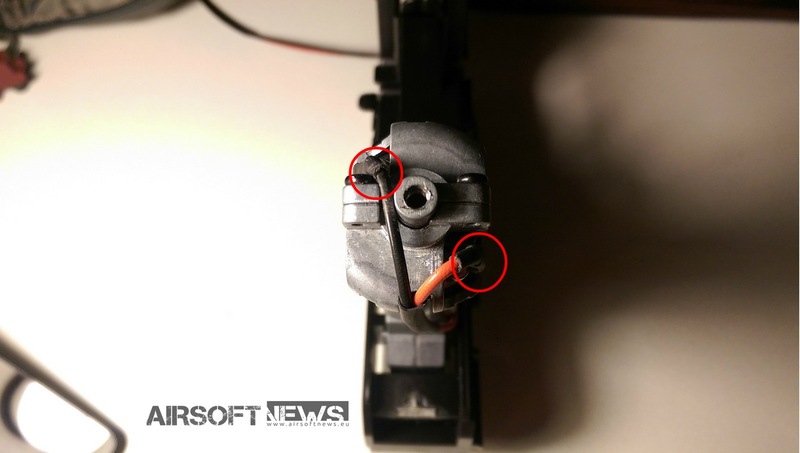 Also do take some care, as the whole stock is mounted on the gun only with a screw on the bottom of the V3 motor cage. So extra motor cage would not go amiss. All in all the gun feels sturdy and quite light. 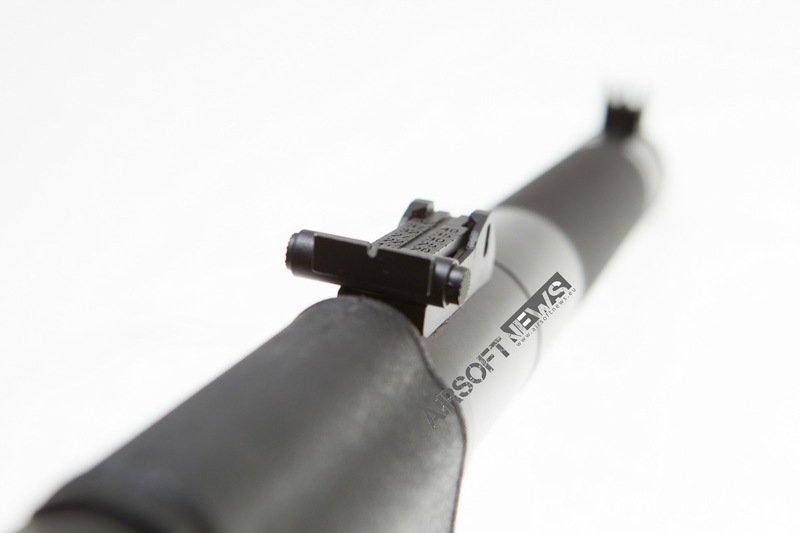 Fire selector is on the tip of your fingertips so you really do not need to reposition your hands or take a look away from your target. This is in the sniper world one of the nicer selectors. Near the trigger is also the semi-auto selector, which is also a first for me. Now for the scope we also got in the package. 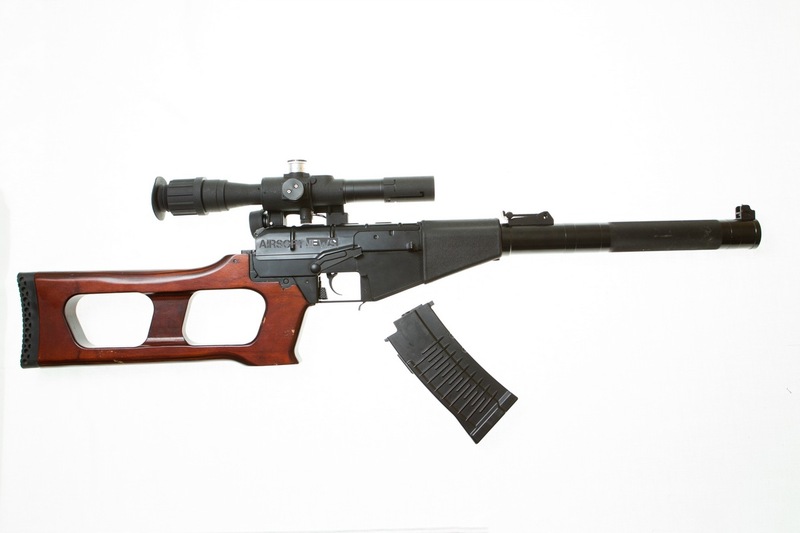 The PSO-1 (Прицел Снайперский Оптический, Pritsel Snaipersky Optichesky, "Optical Sniper Sight") is a telescopic sight manufactured in Russia by the Novosibirsk instrument-making factory (NPZ Optics State Plant) and issued with the Russian military Dragunov Rifle. 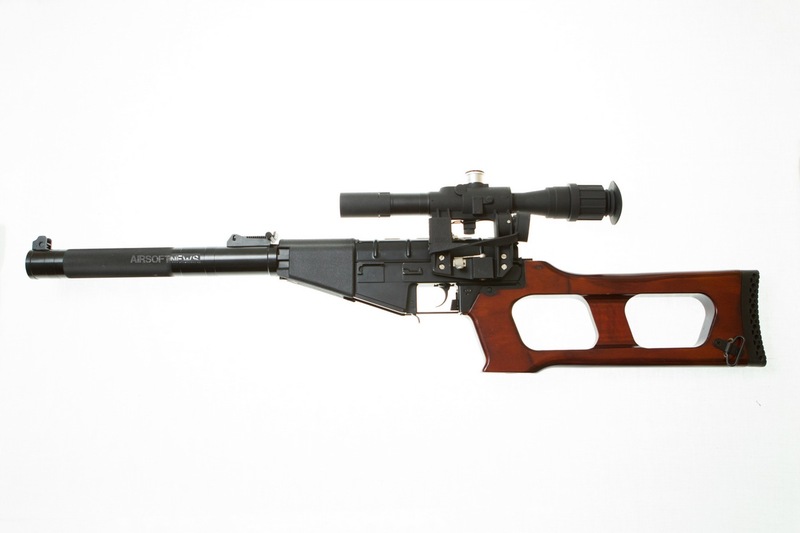 The PSO-1 was, at the time of its introduction around 1964, the most technically advanced telescopic sight ever designed for a mass-production designated marksman or sniper rifle. And let mi tell you the model made by King Arms follows the design to perfection. 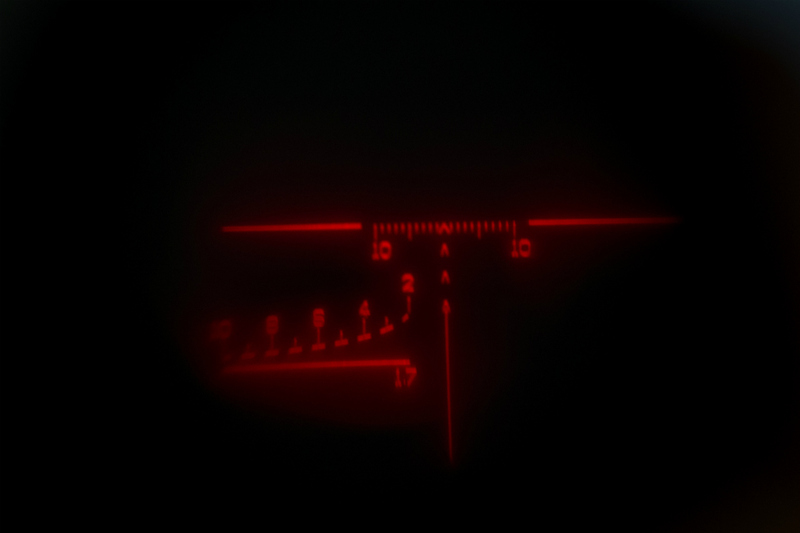 Featuring illuminated reticle that follows the design of the real one perfectly. When mounted on the gun it really makes the difference as you almost hear the Russian hymn in the distance. Badass Spetsnaz look is a big plus. 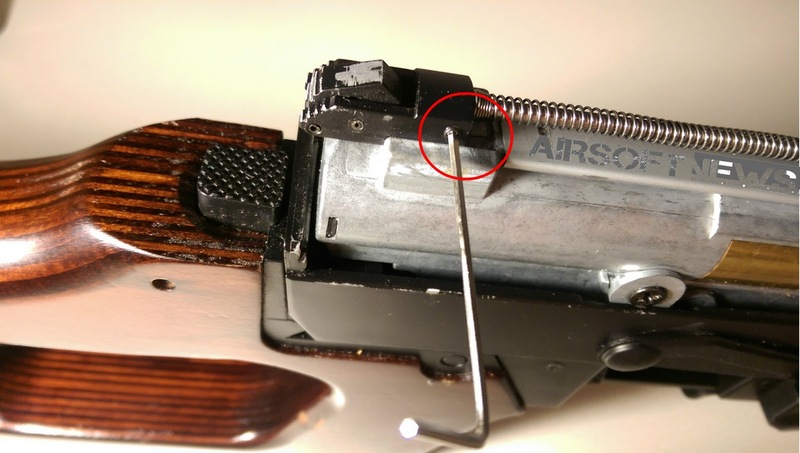 The only problems I encountered with this guns were a wobbly high cap, but that was easily repaired with a bit of self-adhesive Velcro on the left side of the magazine. The biggest problem was the allotted space for the batteries. 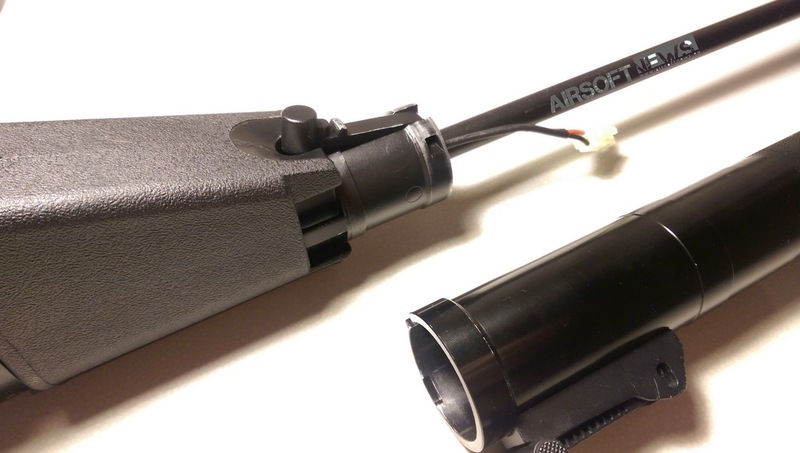 They are intended to fit in the silencer tube and as you can imagine there is not a lot of space. So be prepared for a lot of frustrated moments until you find the right one. And now some instructions how to disassemble this lovely gun. 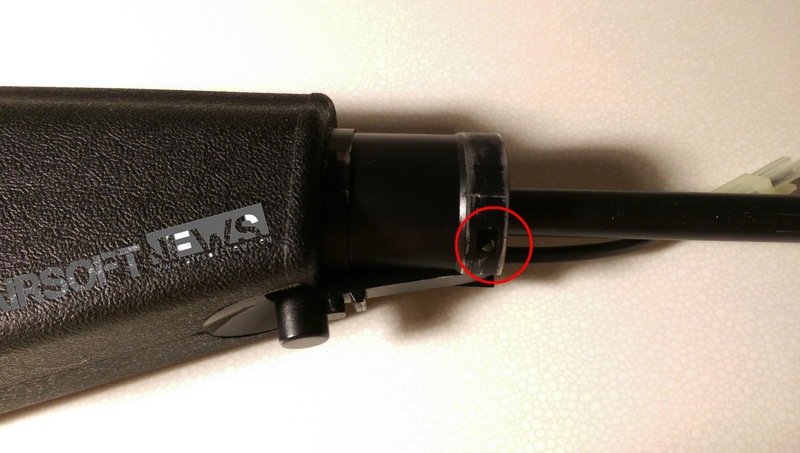 2 - Push the button that holds the upper dust cover in place. 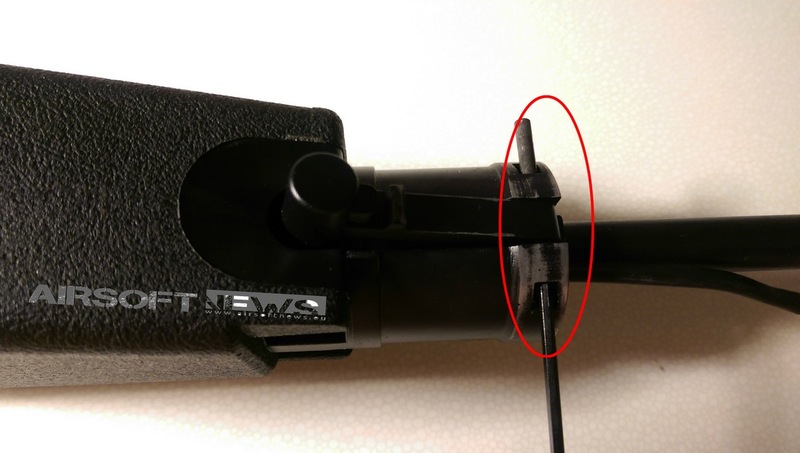 3 - Now you need to remove the guide rod that is fixed in the button. For the removal you will need som pliers and genty pull the rod out. 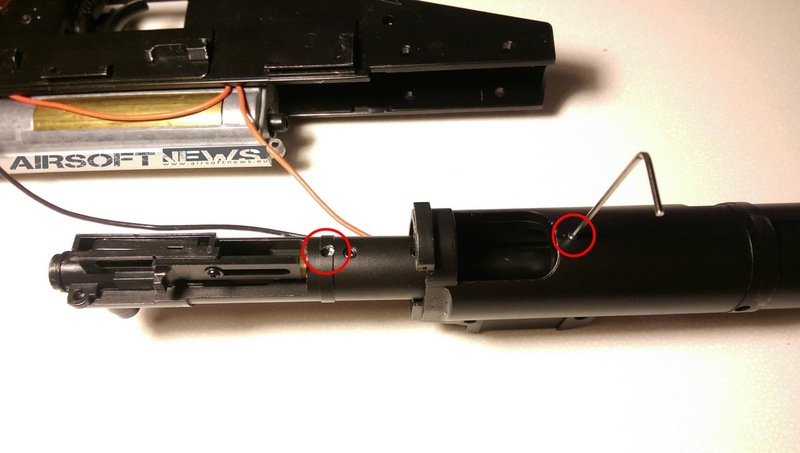 4 - Next in line is a pin that holds the mecahnism for the silencer tube. Use a hammer and a push pin. 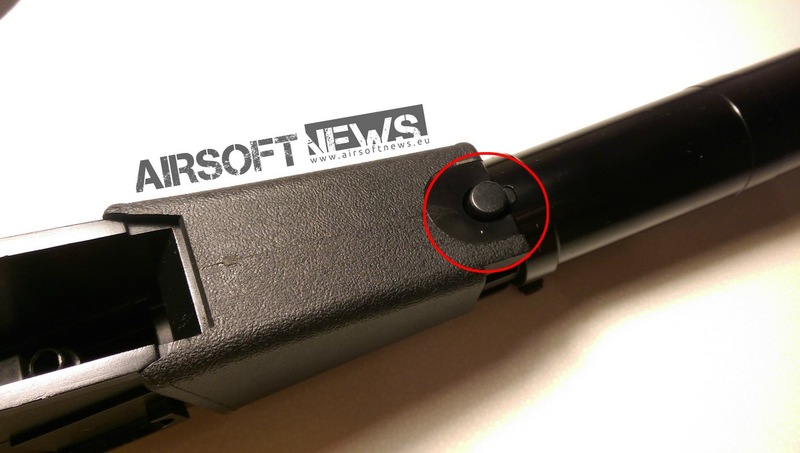 5 - Next in line is a spring powered pin that holds the handguard. Did I mention that it is spring povered. So be careful when removing it. 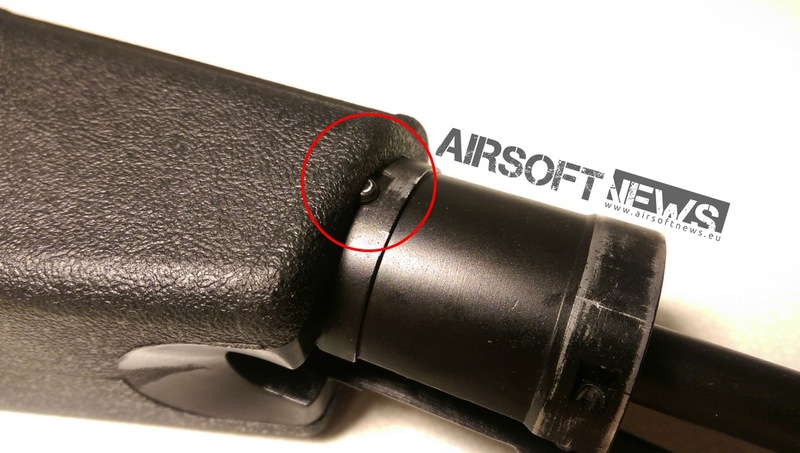 Push in with a flat screwdriver and slide hte handguard sown. Anticipate when the pin will be free. 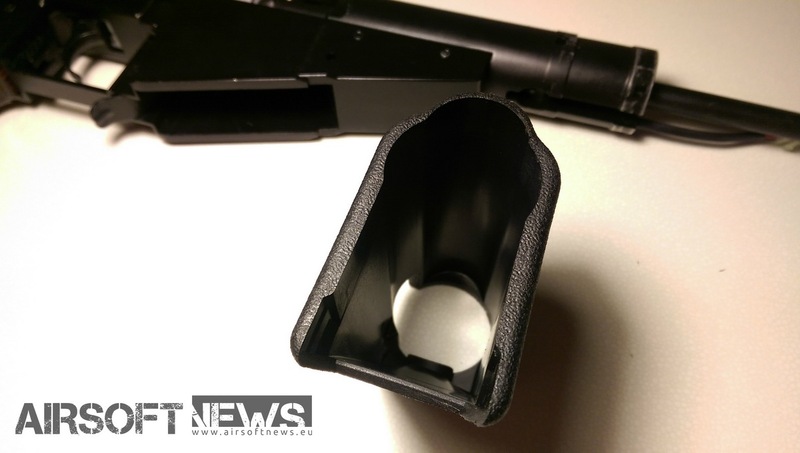 Handgaurd is made form quite sturdy plastic so it will last long time. 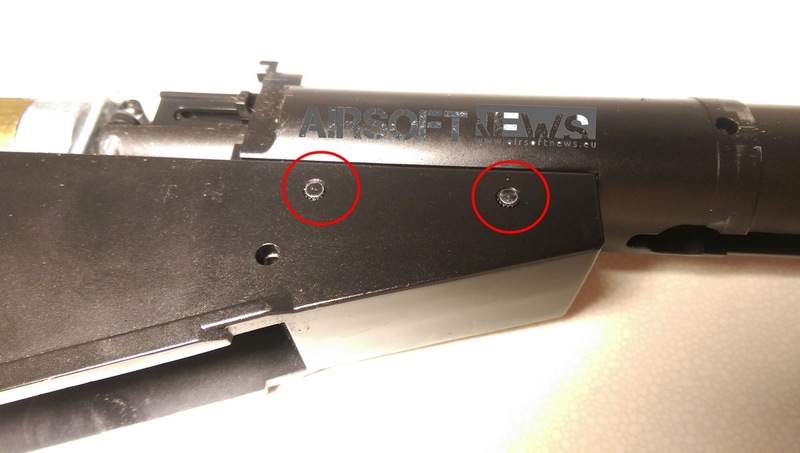 6 - Next to hammer out are twopins that were hidden under the handguard, note their orientation and remove them. 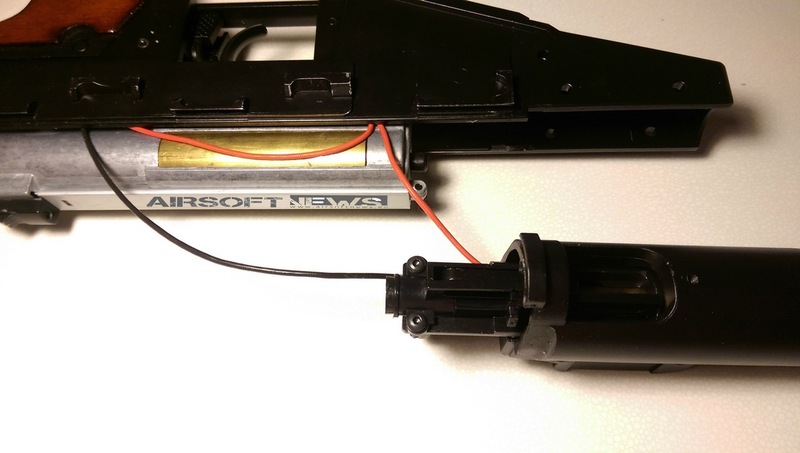 7 - Now you can remove the front end outer and inner barrel assembly. 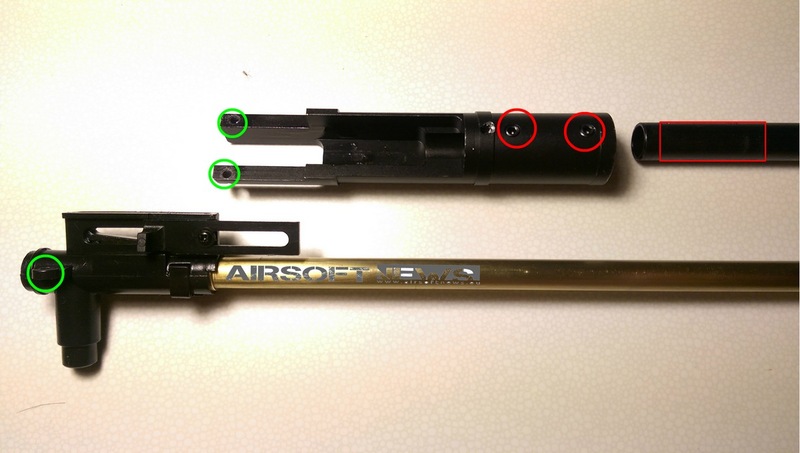 8 - Outer barrel assembly is quite sturdy and so if you wish to remove it you will need through the next steps. 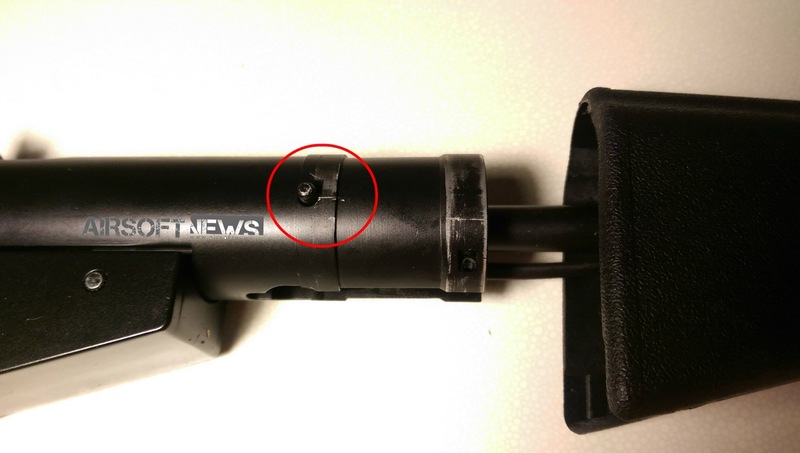 to get to the inner barrel and hop up you will need to remove the screws that are amrked with gren circles. 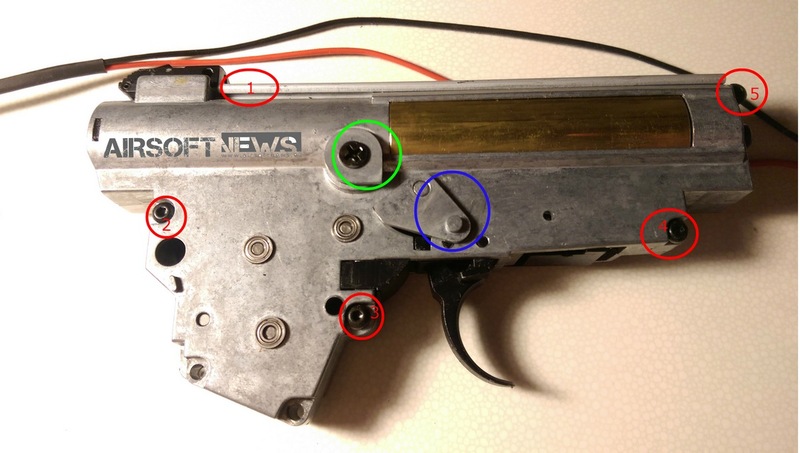 The red circles represent only the screvs that hold together the outer barrel so there is no need for their removal. 9 - Now we arrive at the pistol grip. 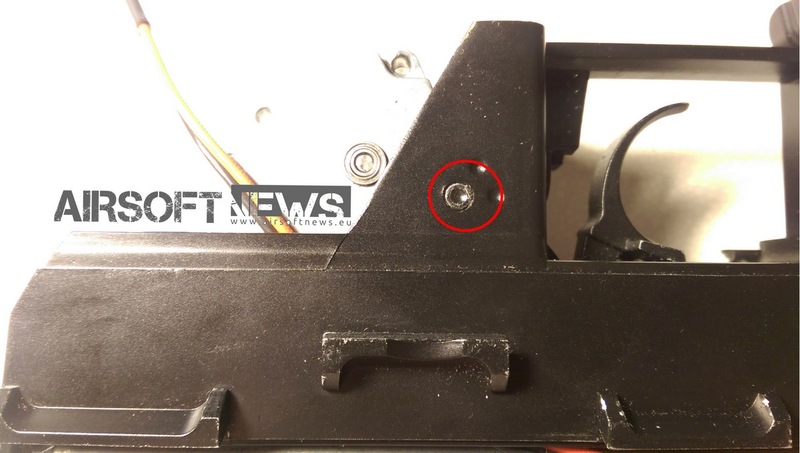 Remove the screw at the bottom. And the stock slides down without a problem. 10 - Now remove the screws that hold the motor cage. 11 - Remove the wires. the motor is fitted nicley in the motor cage so some extra modification is not needed. It is quite strong and I expect it can turn M120 spring with ease. 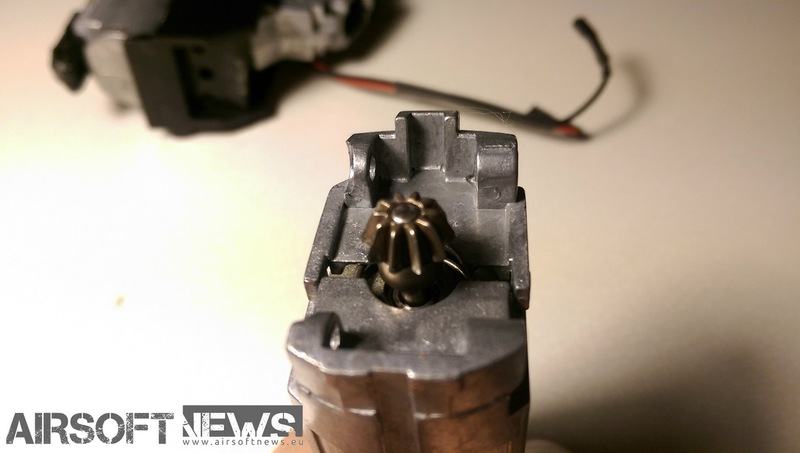 12 - Next pin for your hammers pleasure is located near the trigger. 13 - after sliding the gearbox out of the body you will se these two levers. 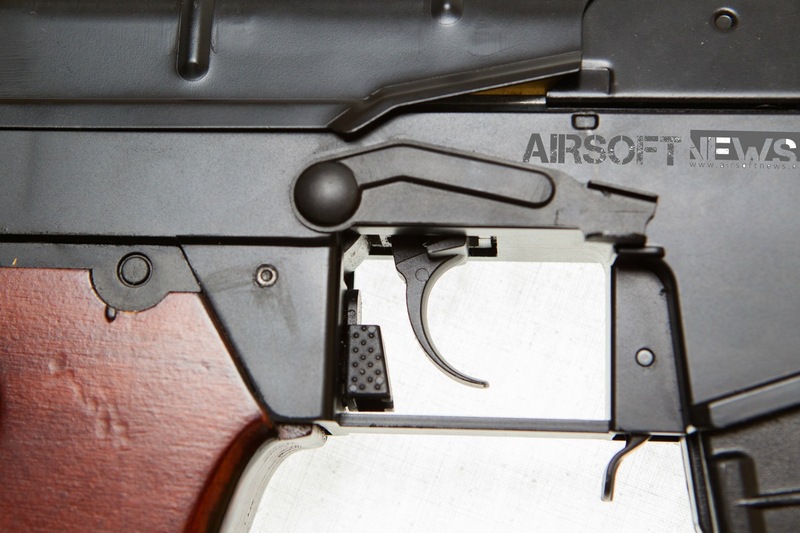 Upper one is for semi - auto selection, bottom one is for safe - fire. The removal of the gearbox takes some wiggling and can be done with ease. So don’t force it. As you can easily bend the safety lever. 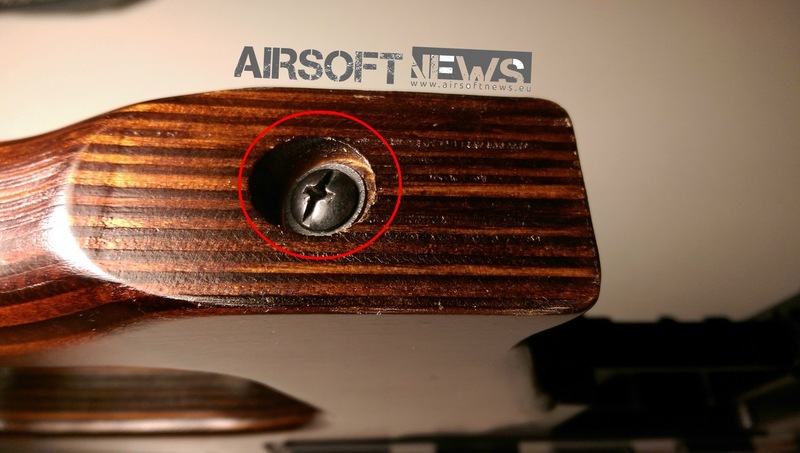 Also the semi - auto lever is not by any way fixed in the body so take care not to lose it. To disassemble the gearbox you need to remove the upper sliding metal plate and 4 screws marked with red. Green one does not require your attention. But be carefull of the blue plate as this one is also free moving and has a tendancy to fall out when putting the body back in the body. It is responsible for safe -fire action. 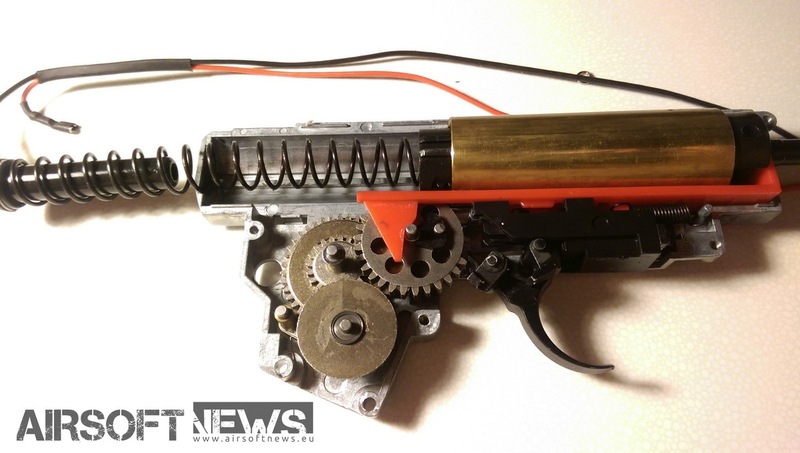 Internals are quite good and I foresee a prolonged use before any replacement. Gears are nicely shimmed, well lubricated, AOE has improved, piston head is ventilated and compression is good. I recommend replacing the nozzle with one that has inner O ring but it is really up to you. 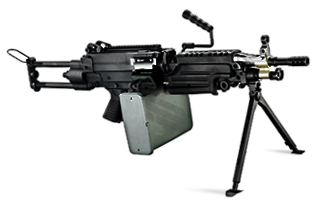 Design of the gun is superb and I would recommend the purchase for every Stalker, Spetsnaz and Russian Army enthusiast. 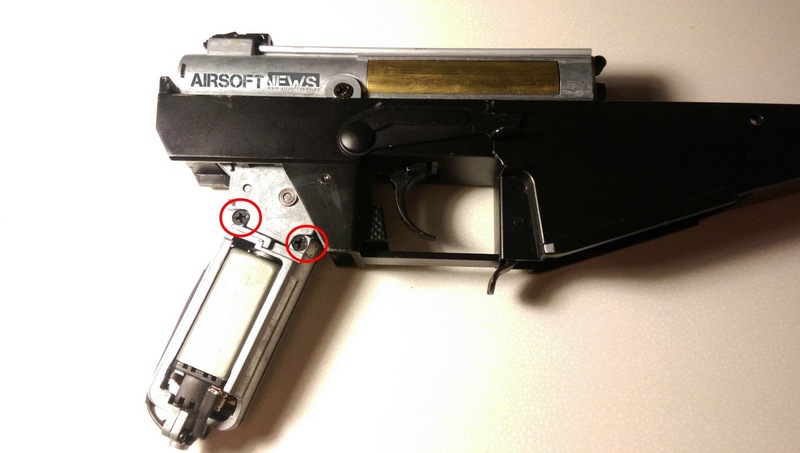 The gun does has some minor annoyances which can be easily circumvented with some time aloted to your gun. 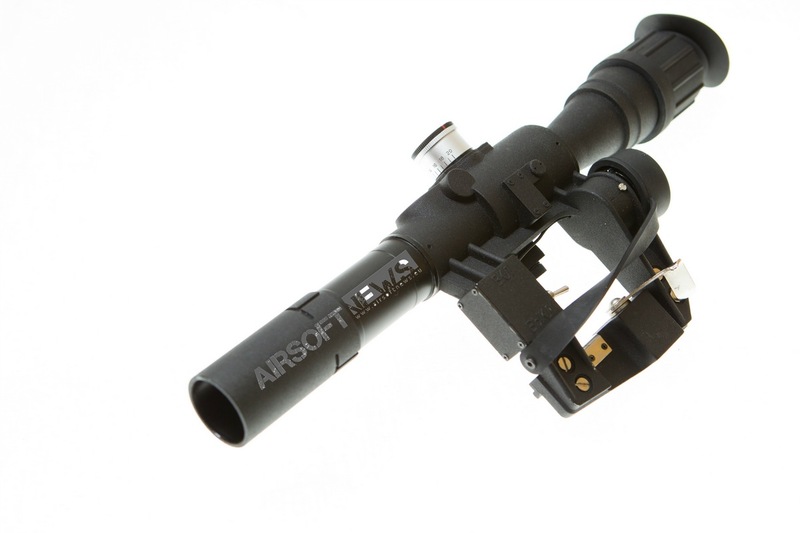 All in all a great purchase,which will not disappoint you and will make many airsofters on the field jelous. I am looking forward testing it on the field. And hopefully you will soon see it in action on our YouTube channel.